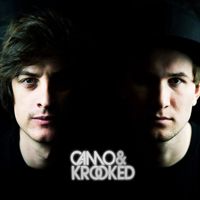 Austrian duo Reinhard Rietsch and Markus Wagner, otherwise known as Camo & Krooked have quickly become one of the hottest production outfits in Europe. Working together since 2007 they were soon being hailed as ?one of the biggest talents in Drum + Bass? by the mighty Grooverider and have gone on to fulfil this accolade since signing to Hospital Records in 2010, winning not one, not two, but three awards in the Drum & Bass Arena Awards 2011 for "Best Producer", "Best Video" and "Best Album". The Viennese pair have created a whirl of dancefloor anthems since they emerged onto the scene a few years back. On Hospital Records they have have brought us soulful, sultry tracks like massive hit single "Turn Up The Music" alongside raw power of smashers like ?Climax? and in autumn 2011, they released their first album on Hospital "Cross The Line"; a fourteen-track rollercoaster ride of emotions, veering between polished vocal-led beauties to filthy tear-out monsters, which firmly establishes Camo & Krooked outside the D+B sphere, as they delve into dubstep, drumstep, electro-house and everything in between. This was teed it up with lead single "All Fall Down (feat. Shaz Sparks)" and "Make The Call (feat. TC)" and later followed up by the release of the title track "Cross The Line (feat. Ayah Marar)". Autumn 2011 also saw the birth of Camo & Krooked *LIVE* - an amazing, multi-sensory show, featuring the pair perched inside an LED-lit cage using iPads and various MIDI-controllers to rearrange and modify their recent hits and trigger visuals, with album vocalists Ayah Marar and TC featuring, plus Messy MC hosting. Designed and built by Justin from Meno TV, Camo & Krooked *LIVE* was taken around the UK on an Autumn Hospitality tour before the duo took it overseas to their native Austria and the rest of Europe. Now working towards the release of a "Cross The Line" remix album, which is due for release early in 2012, the pair are still hard at work, contributing their track "Reminsce" to the "Fifteen Years Of Hospital Records" album and featuring on a number of computer games. Hold tight for more to come from this explosive duo!